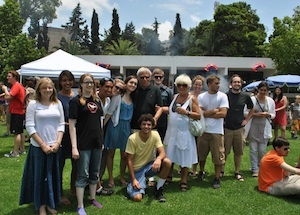 Legacy’s Arabic Language Institute (ALI) students joined in the 4th of July celebration at the American School of Rabat. It was a slice of Americana enjoyed by all the students. They filled up on hamburgers, hot dogs, root beer, Dr. Pepper and ice cream. They also had the opportunity to swim, play basketball and other picnic games as well as just relax and listen to the Navy Band play classic American tunes. At the celebration US ambassador to Morocco, Mr. Samuel Kaplan, met with many of the students and everyone was given a photo opportunity. Mr. Kaplan has been the United States Ambassador to the Kingdom of Morocco since September 2009. The ALI students enjoyed the chance to meet him and all expressed their gratitude for the opportunity to celebrate America’s Independence in Morocco! The ALI program is a cultural and linguistic immersion in the Arabic-speaking world, including leadership training, home stays, site visits, student roundtables, and lectures. 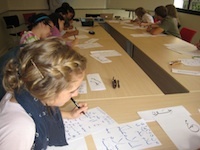 This program is offered by Legacy International in partnership with the Center for Language and Culture (Morocco); it is part of the U.S. Department of State’s National Security Language Initiative for Youth. Legacy has been provided this program to US high school students since 2006. Read participant testimonials.